With color touch LCD & high speed DSP technology, the compact & rugged V7X sets the standard for price/performance ratio. Made in the USA to meet tough UL, CSA, TUV and IEC Hipot requirements – the V7X provides unbeatable speed, accuracy, user safety and reliability. 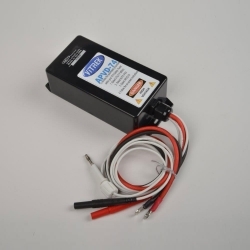 Choose from six low cost models offering AC & DC Hipot to 5KV, leakage current measurement to 100 nano-amps, Insulation Resistance to 450GΩ, Ground Bond to 30 amps and built-in switching. 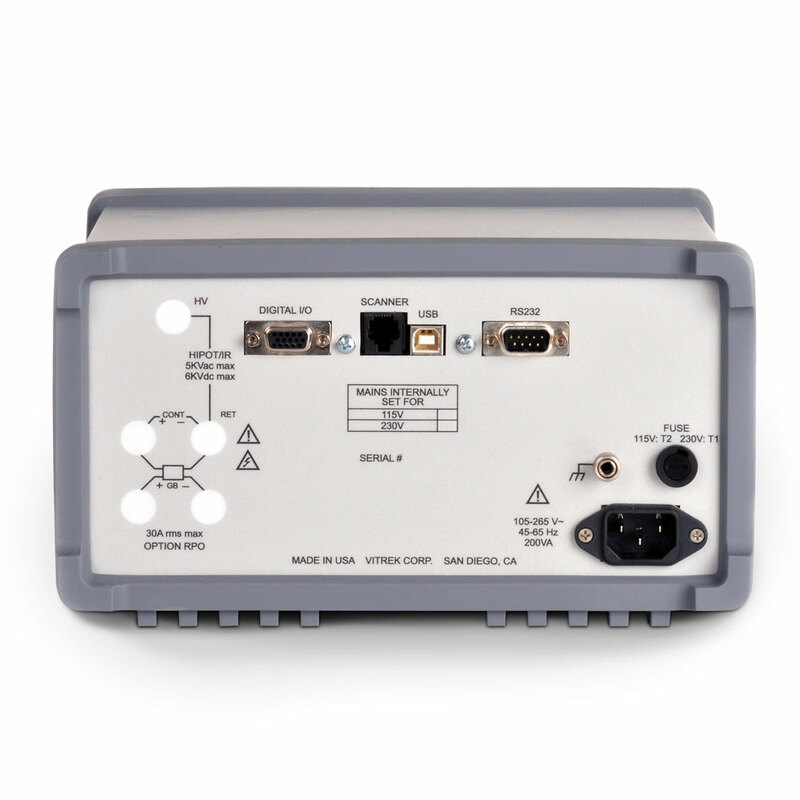 Combine all that with USB, RS232 and Digital I/O interfaces, plus a 2 year warranty. The V7X is simply unbeatable. Customer Testimonial: THANK YOU ! The V71 Hipot Tester is absolutely amazing! Saved us hours of reprogramming, like what to put up with using our old Chinese made Quad-Tech Guardian 1000. You were correct; even an old engineer like me could program it very easily, gotta love the touch screen. Below prices in US$ are for destinations in North America with terms of prepay, net 30 days (OAC) and accepted credit cards. For shipment beyond North America or terms beyond 30 days, please contact the factory for a quotation. AC Hipot Tester. 5KVAC Electrical Safety tester with continuity. 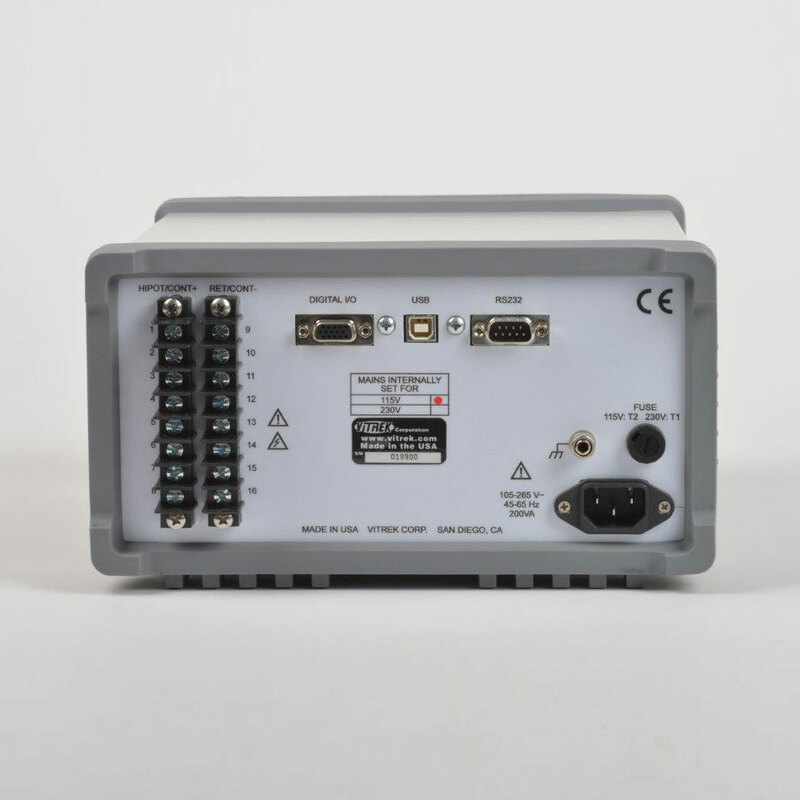 Comes with: TL-209, Power Cord, Operating Manual, QTPro-7 45 Day Free Trial, NIST Traceable calibration certificate without data. ISO 17025 accredited calibration certificate with data and uncertainties available with purchase at reduced price with part number: ISO-CALN-V7X. AC/DC Hipot Tester. 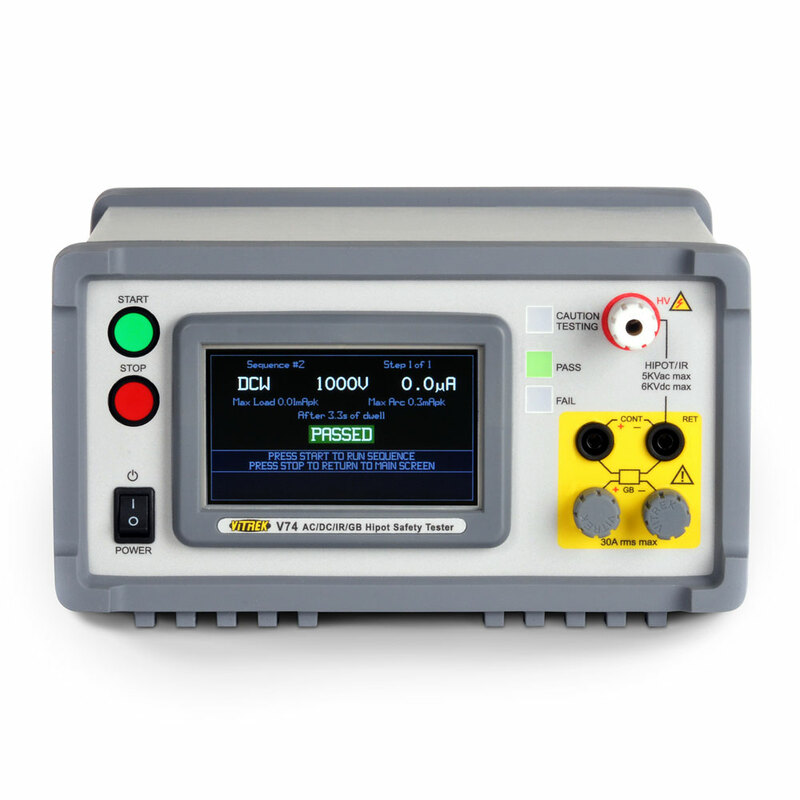 5KVAC/DC Electrical Safety tester with continuity. Comes with: TL-209, Power Cord, Operating Manual, QTPro-7 45 Day Free Trial, NIST Traceable calibration certificate without data. ISO 17025 accredited calibration certificate with data and uncertainties available with purchase at reduced price with part number: ISO-CALN-V7X. AC/DC/IR Hipot Tester. 5KVAC/DC/IR Electrical Safety tester with continuity. Comes with: TL-209, Power Cord, Operating Manual, QTPro-7 45 Day Free Trial, NIST Traceable calibration certificate without data. ISO 17025 accredited calibration certificate with data and uncertainties available with purchase at reduced price with part number: ISO-CALN-V7X. AC/DC/IR/GB Hipot Tester. 5KVAC/DC/IR & 30A GB Electrical Safety tester with continuity. Comes with: TL-209, K-2R, Power Cord, Operating Manual, QTPro-7 45 Day Free Trial, NIST Traceable calibration certificate without data. ISO 17025 accredited calibration certificate with data and uncertainties available with purchase at reduced price with part number: ISO-CALN-V7X. 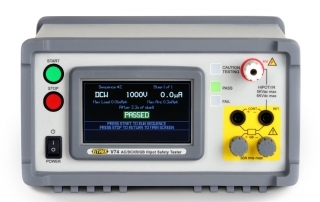 AC/DC/IR Scanning Hipot Tester. 2500VAC/2750VDC/IR/Continuity Electrical Safety tester with built-in switching for up to 8 channels of HV, 8 channels of return, and 8 channels of continuity. Comes with: TL-209, Power Cord, Operating Manual, QTPro-7 45 Day Free Trial, NIST Traceable calibration certificate without data. ISO 17025 accredited calibration certificate with data and uncertainties available with purchase at reduced price with part number: ISO-CALN-V7X. 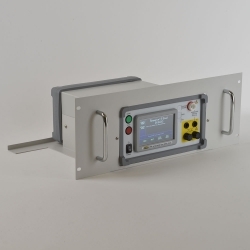 AC/DC/IR Scanning Hipot Tester with Ground Bond Test. 2500VAC/2750VDC/IR/Continuity Electrical Safety tester with built-in switching for up to 8 channels of HV, 8 channels of return, and 8 channels of continuity. Ground Bond available on front panel only. Comes with: TL-209, Power Cord, Operating Manual, QTPro-7 45 Day Free Trial, NIST Traceable calibration certificate without data. ISO 17025 accredited calibration certificate with data and uncertainties available with purchase at reduced price with part number: ISO-CALN-V7X. Ground Bond Tester. 30 Amp 4-Wire Ground Bond Electrical Safety tester with continuity. Comes with: K-2R, Power Cord, Operating Manual, QTPro-7 45 Day Free Trial, NIST Traceable calibration certificate without data. ISO 17025 accredited calibration certificate with data and uncertainties available with purchase at reduced price with part number: ISO-CALN-V7X. Rear Panel Output Only Terminals. This option provides rear panel mounted output terminals. The front terminals are removed and plugged. The V7X is not available with both front and rear terminals. Not available with Model V75. Factory Set 230V Line Operation. 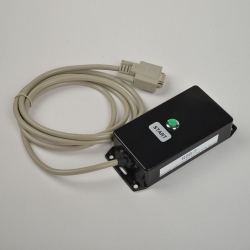 Order this no charge option when powering the unit from 210-250VAC. ISO 17025 Accredited Cal Cert (with purchase). Upgrade from a NIST traceable cal cert with no data to an accredited calibration certificate with data and uncertainties. QuickTest Pro Software. Graphical Test Automation Software for Windows 8 through XP. Easily develop & store test sequences, automatically run tests, view, print, save and export results. Supports all V7X series units and 964i HV Scanner. Daily Performance Verification Device. Many product safety agencies require that an electrical safety tester undergo daily verification of performance. The APVD-7X has built-in test loads for all V7X hipot units. Just hook it up and run the automatic verification sequence. It’s that simple. Daily Performance Verification Device. Many product safety agencies require that an electrical safety tester undergo daily verification of performance. The APVD-74 has built-in test loads for all V7X hipot & GB units. Just hook it up and run the automatic verification sequence. It’s that simple. Daily Performance Verification Device. Many product safety agencies require that an electrical safety tester undergo daily verification of performance. The APVD-79 has built-in test loads for all V7X GB units. Just hook it up and run the automatic verification sequence. It’s that simple. Universal Power Receptacle Hipot Test Adaptor. Receptacle accepts popular North American, European & Asian style power cords – for easy hipot test connection of corded products. 4ft leads. Universal Power Receptacle Hipot & GB Test Adaptor. Receptacle accepts popular North American, European & Asian style power cords – for easy Hipot & Ground Bond test connection of corded products. 4ft leads. Universal Power Receptacle GB Only Test Adaptor. Receptacle accepts popular North American, European & Asian style power cords – for easy Ground Bond test connection of corded products. 4ft leads. IEC 320 C13 Power Socket Hipot Lead Set. 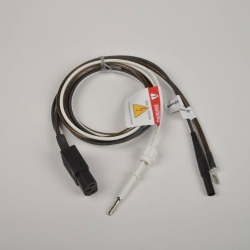 This test lead set makes a convenient connection to the IEC-320 C13 style power inlet of many products. The HV lead is connected to both the line and neutral pins, while the earth pin is connected to return terminal. 4ft leads. IEC 320 C13 Power Socket Hipot & Ground Bond Test Lead Set. 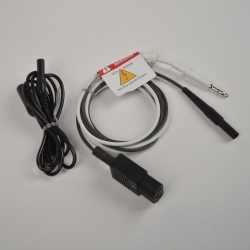 This test lead set makes a convenient connection to the IEC-320 C13 style power inlet of many products. The HV lead is connected to both the line and neutral pins, while the earth pin is connected to source- & sense- terminals. IEC 320 C13 Power Socket Ground Bond Only Test Lead Set. 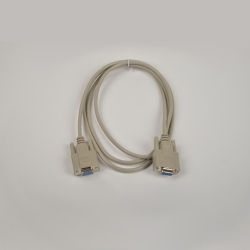 This test lead set makes a convenient connection to the IEC-320 C13 style power inlet of many products. The earth pin is connected to source- & sense- leads. 4ft leads. *White Hipot test lead shown in photo is not included with TL-IEC3. 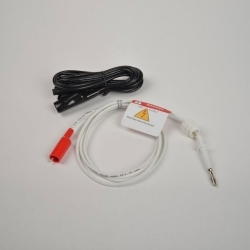 NEMA 5-15 Power Socket Hipot Test Adaptor Lead Set. 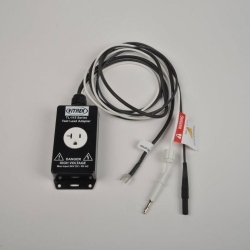 Receptacle accepts NEMA 5-15 style North American power cords – for easy hipot test connection on corded products. 4ft leads. NEMA 5-5 Power Socket Hipot & Ground Bond Test Adaptor Lead Set. 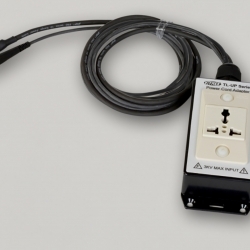 Receptacle accepts NEMA 5-15 style North American power cords – for easy hipot & GB test connection on corded products. 4ft leads. 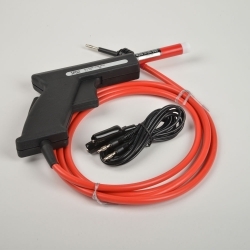 HV Retractable Tip Test Pistol Test Lead Set. For the ultimate operator safety, the HV test probe is only exposed when pistol grip is held and trigger is engaged. 4 ft test HV lead length. 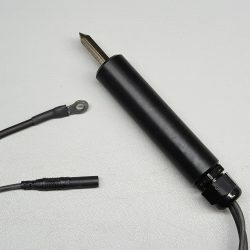 5KV HV Pencil Probe Test Lead Set. 4ft leads. Additional HV/Continuity Test Lead set. 3 piece, 4 ft length alligator test lead set for connection to HV output, return & continuity terminals. 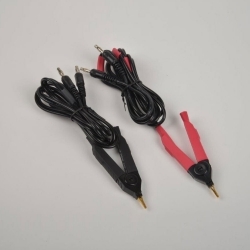 Heavy Duty HV Alligator Clip Test Lead Set. 4ft leads. 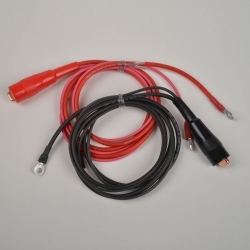 4-wire Kelvin Low Resistance Measurement Lead Set (10A Max). 4ft leads. Additional Ground Bond Lead Set. 4-Wire, 2 alligator clip test leads set, 4 ft length for connection to Ground Bond terminals. 10AWG high flex source wires & 18 AWG sense with 40A rated clips. 40A Handheld Ground Bond Probe. Single Probe. 4 ft length for connection to Ground Bond terminals. 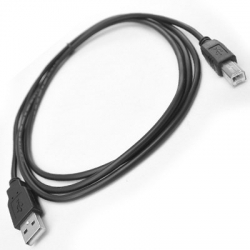 Designed to be used with standard K-2R lead set or additional GBP1. 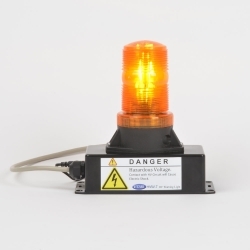 High Voltage Warning Light. Bright LED warning light connects to V7X DIO port and illuminates when units is actively testing. Power supply and 6 ft connection lead supplied. Remote Start Switch. 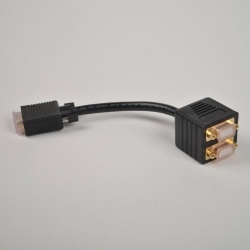 Connects to V7X DIO Port. 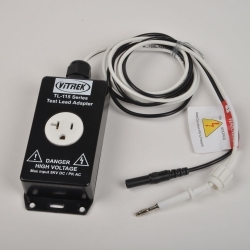 For operator convenience, remote start switch may be located up to 6 ft from the tester. Remote Start Footswitch. Connects to the V7X DIO Port. For hands free operator convenience, remote start footswitch may be located up to 6 ft from the tester. Digital I/O Splitter. 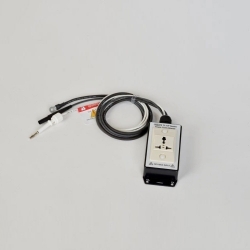 For applications requiring more than one device to access the DIO port, such as using a HV warning light and a remote start switch – the DIO-X2 allows 2 devices to plug into the V7X DIO port. Hard Carrying Case. 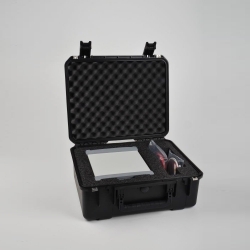 The HC-7X is a tough, durable hard shipping/carrying case with internal die cut foam inserts with room for the instrument and accessories. 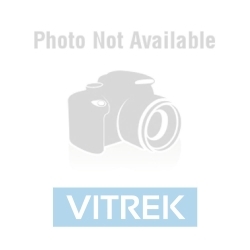 External dimensions are 20” W x 17” D x 9” H.
7” x 19” Rack Mount Kit. The RM-7 is a 4U (7”) high by 19” wide rack mount kit which allows the instrument to protrude through the rack panel while secured to the rack mount tray. Panel mount handles are included. 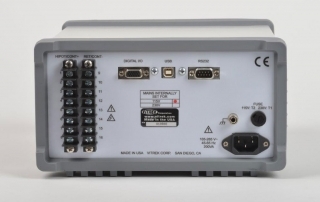 For nearly 25 years, an obsessions has driven us to keep improving how hipot testers perform – speed, accuracy, user safety and reliability have been our driving force. 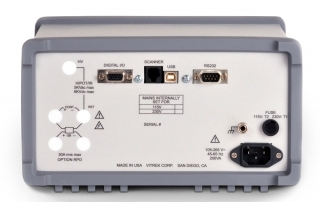 Building a better hipot tester is in our DNA – it drove us to successfully engineer the first 4-in-1 safety tester back in 1990 and it has driven us to redefine performance in low cost hipot testers today. performance in a powerful yet compact multi-function hipot tester – and do it at an entry level price. From our easy-to-use Touch user interface, to its ultra-reliability, high efficiency, fan free design – the V7X provides unrivaled performance. Have we met our goal? You be the judge – compare the V7X to our made in China competitors and see how well American engineering stands up. We build Vitrek Hipot Testers. What’s on your production line? For high voltage cable & component testing – choose the V75 with 16 channels of built-in high voltage switching. 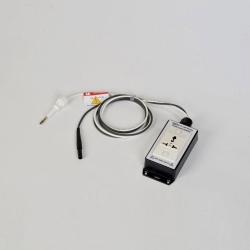 With the versatile V75, you can test hipot or IR for any combination of up to 8 test points and you can measure low resistance (from .001 ohm to 60K ohms) on up to 8 conductors. All automatically with a single touch and all from a single compact tester. For requirements exceeding 8 points, the V7X can control up to 4 Vitrek 964i 64 channel HV Switching Systems – providing up to 256 channels of Hipot test capability. Simple, fast, automatic multi-point hipot – make the switch to the Vitrek V7X. You will be glad you did. Accuracy specifications shown are valid at temperatures within ±5C of the calibration temperature. Outside of this range add 10% of the specification per C.
Decrease maximum ACW, DCW and IR voltages by 2.5%/1000ft above 5000ft ASL altitude. All accuracy specifications are valid at the V7X terminals, and as such do not include any effects due to user wiring resistances, leakages or coupling, or other user generated leakages or interference. Resolutions shown are for displayed measurements, limits and settings. Internally all measurements have typically 10x better resolution and all limits and settings are implemented with the same resolution as entered by the user. 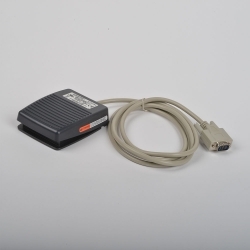 Via an interface, all measurements are reported with 5 digit resolution. Generally, user settings can be defined with up to 4 digit resolution and a selection of units (e.g. µA or mA) from the front panel; or with up to 6 digit resolution from an interface. Unless otherwise specified, user terminated dwell/test periods can extend for up to 2 days. Not all test types are available in all models of V7X. DUT may be isolated from ground or be grounded. If grounded, must be within 3Vpk of V7X ground. The V7X Hipot Tester is available for rent. Please contact the factory for a rental quotation on the items and period of time you desire. Vitrek offers a generous rental allowance for rentals that are converted to a purchase and rentals of 12 months come with a 10% buyout.